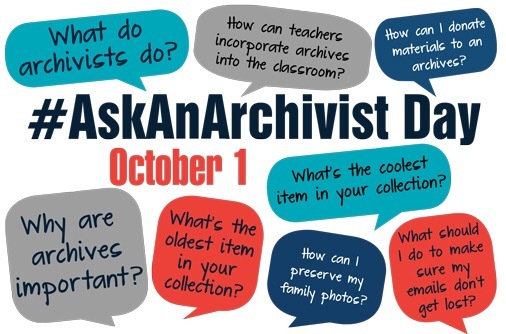 To kick off American Archives Month, on October 1st, ‘Ulu‘ulu will join archivists around the country and take to Twitter to respond to questions tweeted with the hashtag #AskAnArchivist. Take this opportunity to ask any questions you might have about ‘Ulu‘ulu’s collections, about archives or about the archivist profession in general! All you need to do is tweet your question with the hashtag on (or before) Thursday, Oct. 1. If your question is specifically intended for us, be sure to tag us @uluuluarchive so we won’t miss it. How do you decide which videos to digitize? What is the oldest film in your collection? What’s your favorite video in your collection? What’s your favorite Bruddah Iz song? Which local restaurant makes the best mac salad? Okay okay so I may have just made up the last two to make sure you’re paying attention. But hey, the point is ask anything you might be curious about. We look forward to seeing and answering your questions! We’ll do our best to get to each of them in a timely manner. We’ve added an original painting by Avi Kiriaty to our archives space. The painting, entitled “ohana”, was dedicated to the memory of Henry Ku‘ualoha Giugni – ‘Ulu‘ulu’s namesake and a dear friend of Senator Daniel K. Inouye. This very same painting used to hang in Senator Inouye’s Honolulu office and is currently on loan to ‘Ulu‘ulu from the Daniel K. Inouye Institute. Original painting by Avi Kiriaty entitled “ohana”. We mahalo Mrs. Irene Hirano Inouye and the Daniel K. Inouye Institute for sharing this beautiful painting with us! We also welcome you all to come visit us to view the painting (and our collections! ).